No! He’s not fighting the fans of the Ultimate Warrior, because that would actually make sense. Ric Flair was apparently throwing down with fans of the Golden State Warriors. It’s hard to know when Ric Flair is telling the truth anymore and / or what team he’s rooting for on any given day. But, okay Nature Boy, I’ll bite on this one. He has been chirping at the Cavaliers for a few years now and they have paid him to make an appearance. So, anything is possible. I’d just like to note that Ric Flair is 68 years old. He’s a 68 year old man, fighting people over a basketball team that he started cheering for three years ago. Bleacher Report: “Rihanna, Move over and Let the Naitch show you how it is done!” Flair added, alluding to the singer’s heckling of Warriors players during Game 1 of the 2017 NBA Finals. Keeping track of Flair’s various sports allegiances hasn’t been easy, but the 16-time world champion has remained consistent on the Cavs over the last few years. In a robe decked out with the team’s colors, Flair showed up in Cleveland during Game 4 of the 2015 NBA Finals. 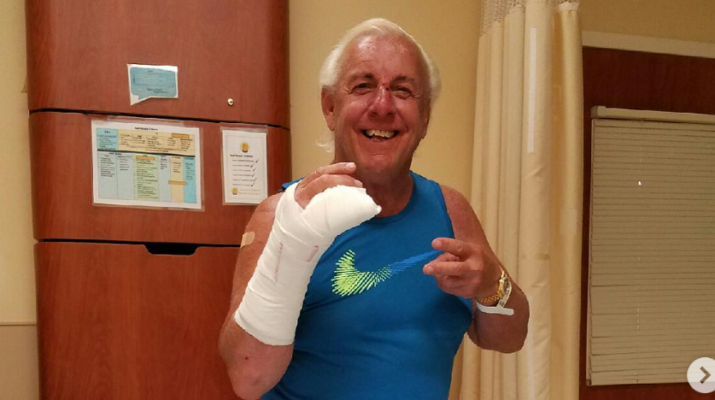 Ric Flair is also the ultimate Twitter troll. Max Kellerman, no one tells the world KD is better than lebron james…..Read the poll- 76/24 … Max, stick to boxing…..
See you Wednesday night in the Land let’s Discuss face to Face. Max Have You Really Played A Sport? If So Plz Elaborate! !